40th “Jaszowiec” International School and Conference on the Physics of Semiconductors is organized in Krynica-Zdrój, from June 25th to July 1st, 2011. The attendees will be mostly accommodated in two hotels, Motyl and GeoVita. Depending on the number of registered persons, places in other smaller hotels in the neighborhood are available. The scientific activities (lectures, poster sessions) will be held in the Motyl hotel, which has an air-conditioned lecture room for 220 participants. The conference registration desk will be located in the Motyl hotel and will be open starting at 16:00 on Friday, 24th of June, 2011. Detailed map can be found here. A conference bus will be arranged from Kraków (train station Kraków Główny) to Krynica-Zdrój. For more details and a guide to travel to the conference site please choose the bookmark: Useful local information from the left menu panel. 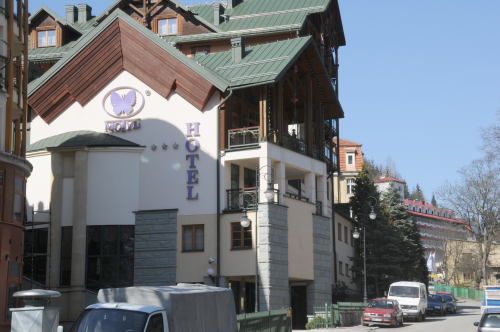 Hotel Motyl - location of Conference registration desk and presentations hall. Geovita Hotel seen in the background.